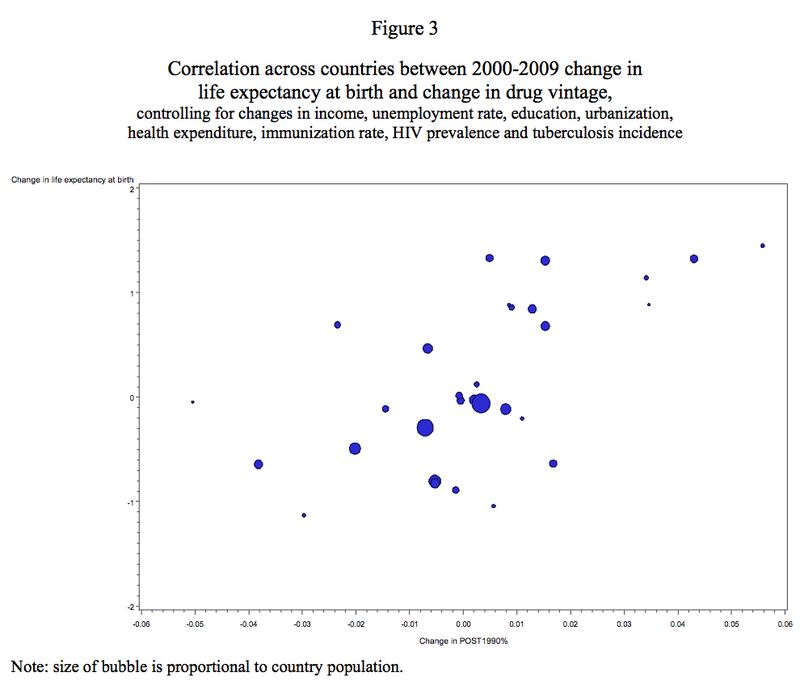 We examine the impact of pharmaceutical innovation, as measured by the vintage of prescription drugs used, on longevity, using longitudinal, country-level data on 30 developing and high-income countries during the period 2000-2009. We control for fixed country and year effects, real per capita income, the unemployment rate, mean years of schooling, the urbanization rate, real per capita health expenditure (public and private), the DPT immunization rate, HIV prevalence and tuberculosis incidence. The gist of this study comes from simple hypothesis that the health and longevity of a population is somewhat dependent on how prevalent advanced technology (including drugs) is. For the purposes of this analysis, the authors operationalized that in terms of “vintage”, or the average year a drug was invented or first used. They looked at 30 developing and high-income countries in 2000 and 2009, using a database of more than 89,000 pharmaceutical products. They also used the amount of advanced imaging equipment available as a proxy for non-pharmaceutical medical innovation. Longevity was calculated using WHO life tables. Vintage was calculated as the quantity-weighted-mean launch year of products sold in each country in a certain year. I will admit that some of the modelling is above my ability and would require an economist. So if someone comes along and proves the math totally wrong, then so be it. What you are looking at is the relationship between the change in life expectancy (y-axis) and the vintage (x-axis). The size of each bubble is the population of the country the point represents. There’s definitely a positive relationship between the two. Overall life expectancy and survival above age 25 went up faster in countries which had newer drugs. This held true even after controlling for other factors. The vintage, again as a metric of pharmaceutical innovation, accounted for almost 75% of the average 1.74 year increase in life expectancy seen overall from 2000 to 2009. 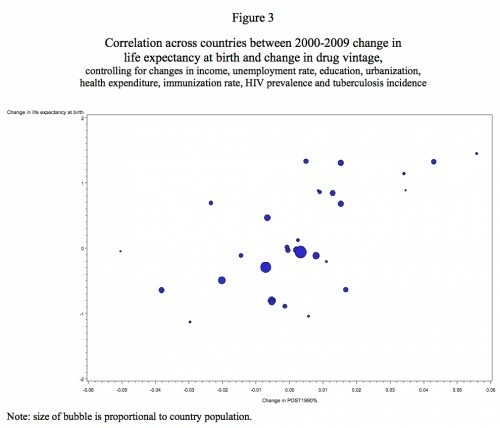 When they looked at the top five countries with respect to drug vintage versus the bottom five countries, there was more than a nine year difference in life expectancy, and their analysis said that about one-third of this difference could be attributed to the vintage of drugs used. There are a few caveats here. Much of the innovation occurred long ago, as the definition of vintage in the chart above has to do with a question of whether a drug was introduced before or after 1990. So this isn’t the best thing to cite to support the “innovation” of the last few years. It’s possible that the me-too drugs of the last decade or so might not show the same relationship. This study also uses life expectancy as a metric of interest, and many of the same people who defend pharmaceutical innovation (and worry about innovation in general in health care) often say that life expectancy is a bad metric to use to judge the performance of health care (of which drugs are a part). That said, this is a data point that shows that the use of newer drugs according to the definitions of this paper has a relationship with increased life expectancy. We should’t make too much of it, but we shouldn’t ignore it either. I think it is important that readers know this, though I am making no claims about what it means.